This volume of One-Punch Man is hilarious and really pokes fun at organizations and ranking systems. Both Genos and Saitama pass their Hero Certification exams with “flying colors,” however, Saitama is ranked at the bottom of class C and Genos is ranked way up above in the S category. To give Saitama some credit, he did pass the physical exam with 100% completion. He bombed the written exam and that is what dragged down his grade. After nearly a week of bumming around once becoming an officially registered hero, Saitama finds out that C level heroes are expected to catch one bad guy a week. As a result, our baldy hero sets out upon a wild goose chase. Unfortunately, a crazy ninja reappears and is bent on fighting the class C hero. With two days left in the week, can Saitama keep his hero status? 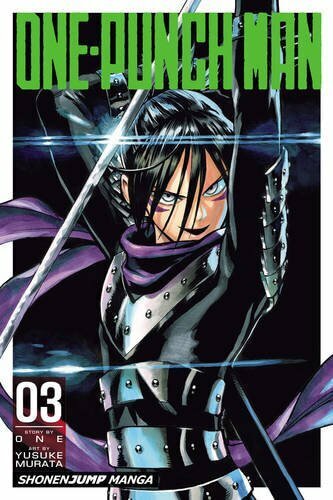 This volume really picked up the pace of One-Punch Man. It takes a well-needed break from the predictability and monotony of the first two installments. I found this release to be funny, unpredictable, and action-packed in an over-the-top, humorous way. It is volumes like these that make you happy that you held on tight despite wanting to drop the series because of boredom or skepticism. If I had any doubts before about this series, the author brushed them aside with one punch. You should definitely get into this series.